← Fusion Collective South Jazz Trio at The Oxford Gastropub! The subject of this week’s picture is a small cheese plate I enjoyed during a recent visit to Vinos Finos y Picadas located in the new Lafayette Village Shopping Center in North Raleigh off Falls of Neuse Road. Vino’s is a South American wine cafe’ that features wines primarily from Argentina and Chile. 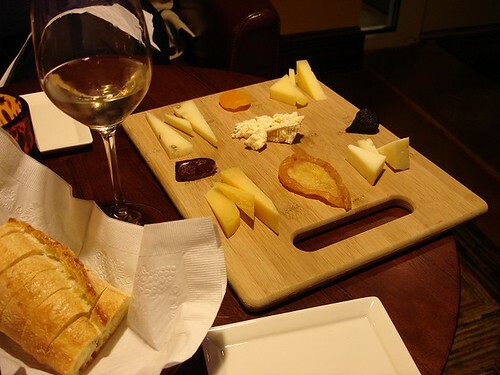 They also offer a nice selection of meat and cheese plates in along and other “picadas” (an Argentine plate meaning “bites”) to accompany their wines. This particular plate was $9 and came with five different cheeses along with fresh bread and a piece of dried pear, appricot, date, and fig. I plan to go back to Vino’s soon to enjoy some of the wine “flights” that they offer during the week. What do the “flights” entail? I’ve heard great things about that place and I can’t wait to get over there to try it. Thank you for the enticing photo! Wine flights are tastings of multiple wines (usually 3 oz. pours of 3 to 4 wines at a time). They are typically grouped together in order to get a feel for breadth or depth. Wine flights are usually intended for those new to the experience of tasting wine, or those who want to increase their understanding of a specific region. Hope that helps! Let us know what you think of Vinos when you get a chance to visit. I’m hoping to get back there soon as well. Thanks for stopping by my blog!